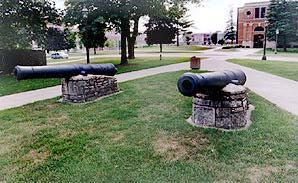 These two cannons have been part of the UNI campus for more than 95 years, but their history goes back much farther. They were among 80 guns brought to Florida in 1565 by Pedro Menendez d'Aviles, the founder of St. Augustine. The guns were part of that town's defenses, and were used in 1702 and 1741 against the English. When Spain sold Florida to the United States in 1819, the cannons became the property of the federal government. They were presented to the University in 1901 through the efforts of Congressman D. B. Henderson and the Cedar Falls post of the Grand Army of the Republic. These UNI landmarks are located on the eastern edge of the campus, just north of the President's House. Stacks of cannon balls that once stood next to the cannons became "bowling" balls for students and were eventually converted to scrap metal during World War II.